Hi guys! The sun is shining, I got a nice 7 hours of sleep and I’ve already made 1 dough and 1 pan of rice noodles. All in all, great start to the morning. Plus, I had a great weekend. Valentine’s is always a really big time for us. For one, February 13th is our anniversary. 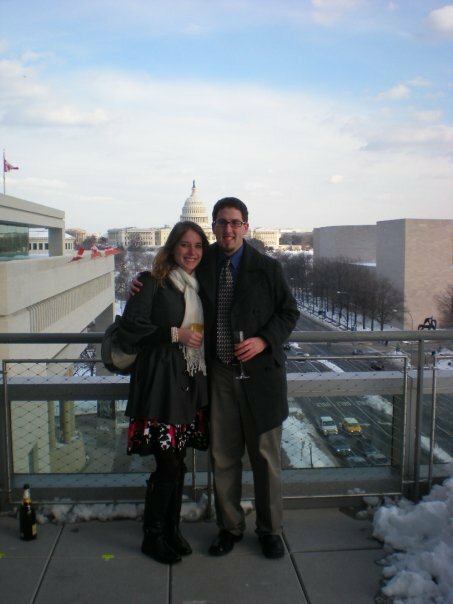 Secondly, in 2010, that’s the day E proposed 🙂 [Also the day after a freak blizzard]. So each year, we kinda do it big. And this year was no different. To kick things off, we went to Woo at the Zoo at the National Zoo. It’s a thing they do each year where they talk about animal mating patterns, yes I’m serious, and serve hors’ devours. It was actually really funny and we got these cute glasses! Then we went to dinner at Toscana West, a cute little Italian place on I street in DC! Shockingly, I took no photographs. The food was good (not awesome but not horrible) and the ambiance was super cute (just borderline tacky). BUT! The best part of the evening? They had live opera singers! So, while we finished our meal, we were serenaded by an amazing group of opera singers. It was awesome. 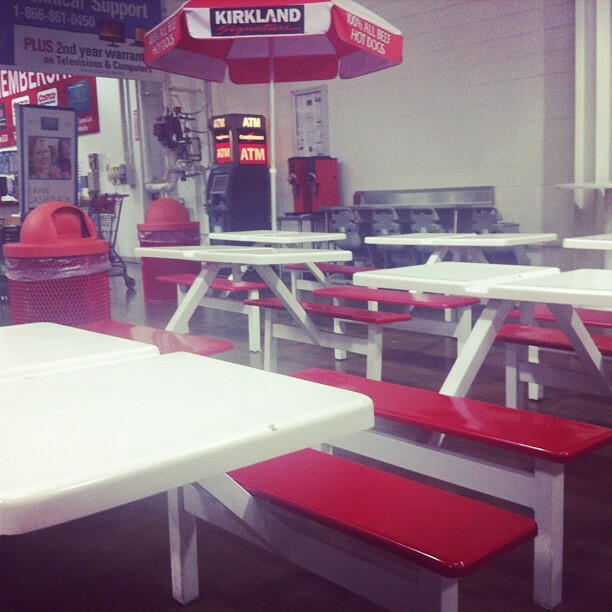 Then yesterday, we did a big trip to Costco (where it was CREEPILY EMPTY, see below) and stocked up on some tasty steaks for tomorrow’s dinner and a ton of eggs. I also had time to relax (which doesn’t happen often) and had time to whip up these absolutely incredible banana walnut cookies for the Secret Recipe Club. The blog I was given was A Dusting of Sugar and it was so hard to pick what recipe to choose! She’s got a ton of great recipes, including some delicious looking homemade bread recipes which I’ll definitely be trying out in March (I’m tackling 6 yeast recipes that month!) After drooling through her posts, I found one that I knew I just HAD TO MAKE. 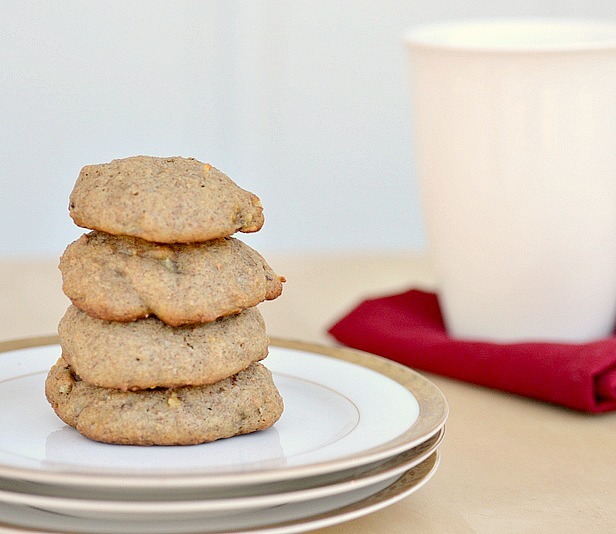 Banana oatmeal cookies. As you can see with mine, I omitted the oatmeal simply because I didn’t have any. So, I just doubled up the flour (whole wheat) and wa-la! These gorgeous, delicious and soft cookies were born. 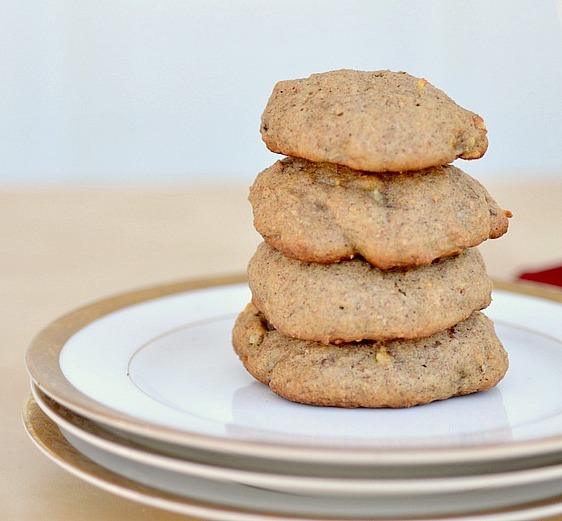 One of my favorite breakfast breads is banana nut bread and these cookies taste JUST like a warm loaf out of the oven. Except they are portable, smaller and easier to eat! In true Claire fashion, i lightened these up by swaping 99% of the butter for applesauce and using whole wheat flour. Because of the applesauce, the cookies had the same light as air, fluffy and chewy texture as my 42 calorie pumpkin ones. Because the taste and look so closely resemeble banana bread, I don’t see why you couldn’t eat these for breakfast. I mean, there’s fruit in them, that’s totally healthy for breakfast. (Spoken like a true RD to be). Recipe adapted from A Dusting of Sugar and Simply Recipes. Beat sugar, applesauce and butter together with a handheld mixture until creamy. Add egg yolk and vanilla and beat until fluffy. In a shallow bowl, mix bananas and baking soda together and let sit for 2 minutes. Add bananas to egg mixture. Gradually add in flours, salt and cinnamon and mix until combined. Stir in pecans. Cover dough with foil and chill for at least an hour. Once chilled, preheat oven to 350F. Measure out about 1 teaspoon of dough and place on a greased cookie sheet. Repeat, placing dough about 1/2 inch apart. Cook for 9 – 11 minutes, or until golden brown. Cookies for breakfast are the BEST. [I say as I’m eating two of them with my coffee]. These look excellent!! Love the applesauce in them! These look fabulous, I love bananas! Congrats on one year. Time sure flies! 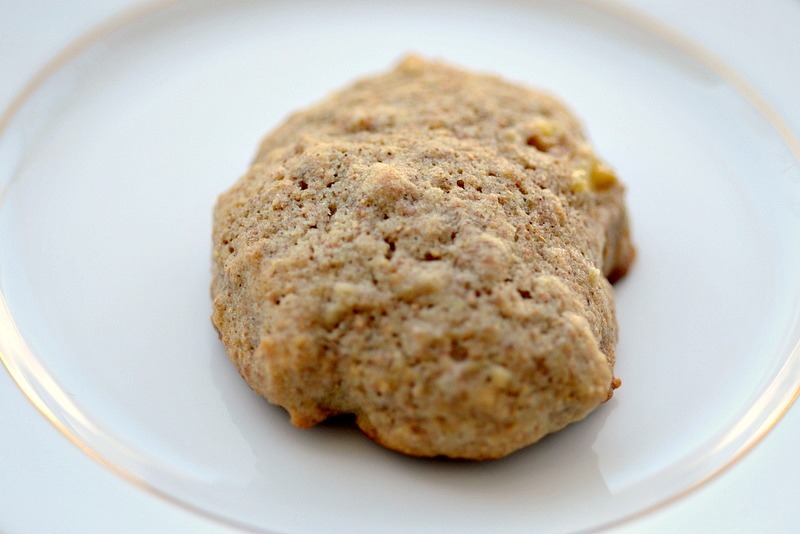 I love soft cookies and "portable banana bread" is just a good idea. Great job! We eat healthy cookies for breakfast all the time. makes me feel like a rebel without a cause. Pinning these. A fellow DC-ist! Will have to try Toscana West! The winter of the blizzard was my first year here, from Michigan... I thought I was moving away from the snow! Happy valentines day! PS these cookies look wonderful! These look great! I am trying to bake healthy these days so love finding recipes like these. And your celebrations sound fab. Love woo at the zoo! Love this recipe! Looks wonderful!!! Sweet story and delicious cookies! 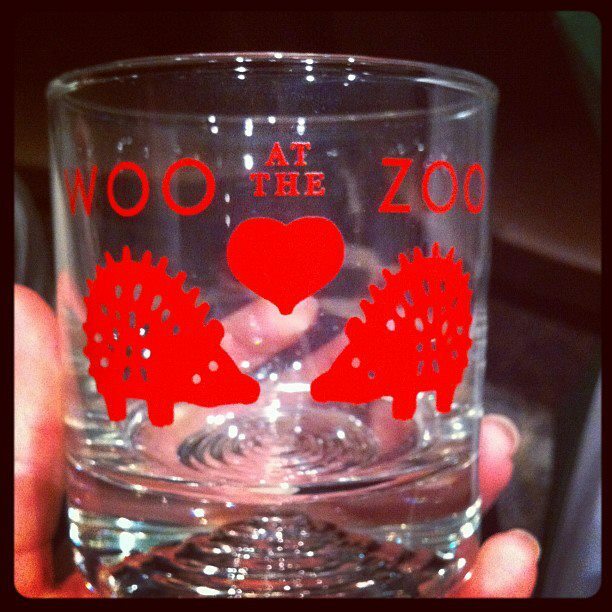 Love the Woo at the Zoo glass. Every time I bake with applesauce the end result is always a little bit chewy...missing the crunchiness...is this also true for these cookies? They look amazing in the picture but you can't really tell if thee're crunchy or not. These cookies are amazing! They're good for you, so there's no guilt after eating them. Make these cookies, then eat them. All of them. 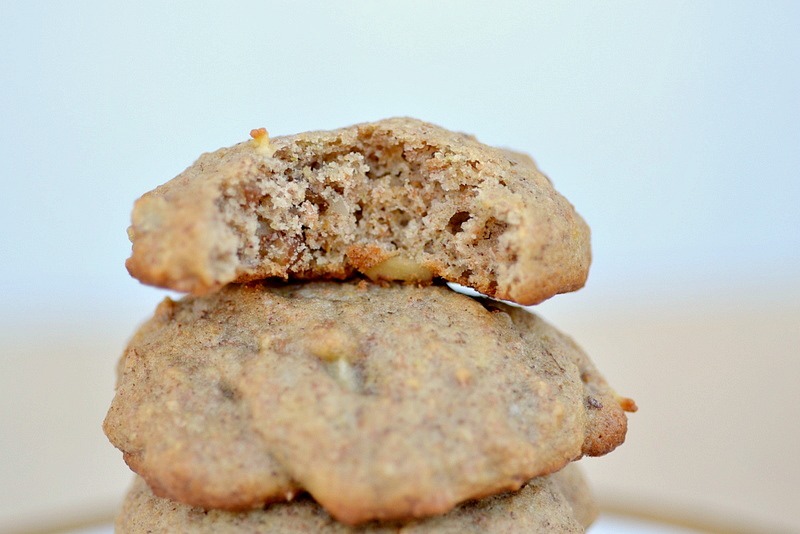 I took mine out before they could get crunchy, and they taste like soft mini banana breads! Pretty delicious and healthy enough.